Irwin Naturals 3-in-1 Joint Formula comes in a nice looking packaging and it is based on a formula designed to rebuild cartilage in your joints, lubricate them and soothe your pains. This 3 in 1 formula sounds very appealing, because it seems to treat all the symptoms and causes of joint pains. However, a closer look is needed to see if this product is all that is pegged to be. What Does Irwin Naturals 3-in-1 Joint Formula Contain? Besides these active ingredients, Irwin Naturals 3-in-1 Joint Formula contains quite a few extras, like St. John’s bread, soy lecithin and titanium dioxide. While the list of compounds is quite impressive, keep in mind that all the above figures are for one serving, consisting of no fewer than six capsules. So, you will have to take a lot of pills daily to see the effects. According to the label, you need to take six capsules daily, all at one time, or spread out through the day. It is highly advised to not exceed the recommended dosage. Also, there is a warning regarding the product containing a compound that can cause birth defects and reproductive harm, so pregnant women are advised against taking this supplement. The listing price for this health supplement is 31.95USD. Since a bottle contains 90 capsules, or 15 servings, it only lasts half a month, so it is not cheap. Irwin Naturals 3-in-1 Joint Formula is sold through third parties, so you may have to take any refund issues to resellers. 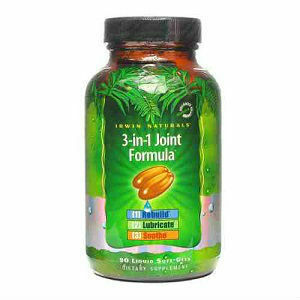 Irwin Naturals 3-in-1 Joint Formula sounds like a powerful blend for treating joint pains and discomfort. However, it does not contain hyaluronic acid, a main component that should be present in any joint health supplement, and it also requires you to take a large quantity of capsules every day, in order to see results. Mark Stevens	reviewed Irwin Naturals 3-in-1	on January 15th	 and gave it a rating of 2.